The Hellenic Initiative Australia has funded a volunteer medical mission by Axion Hellas to four remote Aegean islands next month, which will provide preventive and specialised medical care for people living in these isolated communities. The AU$50,000 grant is supporting Axion Hellas’ 7th Sea Crossing, which will visit the Dodecanese islands of Astypalea, Tilos, Halki and Kastellorizo between 6-14 April 2019. 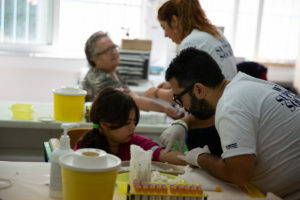 Axion Hellas will set up temporary clinics on each island, providing access to specialist doctors and a comprehensive range of medical tests, including blood tests, eye and breast examinations and ultrasounds. The medical team will include approximately 50 doctors (of about 23 medical sub-specialties), 8 nurses, 5 dentists and 43 allied health professionals and support personnel. “The Hellenic Initiative Australia is proud to continue its support for Axion Hellas and provide critical medical care to isolated and vulnerable island communities,” said THI Australia President, Nicholas Pappas AM. “People living on these remote islands, particularly the elderly, face many challenges accessing basic and specialist healthcare, even more so during the winter months,” Mr Pappas said. The grant was welcomed by Axion Hellas President Vassilis Pateras, who met with the THI Australia Board in Sydney in February. “We are very honoured to have joined forces with The Hellenic Initiative Australia in this important mission, which supports people living in remote communities and helps to save lives,” Mr Pateras said. As well as providing medical care during its annual missions to remote and isolated communities, Axion Hellas provides cultural and educational activities and funds infrastructure projects. A highlight of this mission will be a free concert by renowned performer, Alkistis Protopsalti in Kastellorizo on 13 April.